The remains of a permanent settlement which could date back to the Iron Age has been uncovered on a remote Scottish island, according to archaeologists. It was previously thought Boreray in the St Kilda archipelago was only visited by islanders to hunt seabirds and gather wool from sheep. Archaeologists have now recorded an extensive agricultural field system and terraces for cultivating crops. They have also found an intact stone building buried under soil and turf. St Kilda's group of small islands are the remotest part of the British Isles, lying 41 miles (66km) west of the Western Isles. Hirta, the main island of St Kilda, was occupied until 1930 when the last islanders left after they asked to be evacuated because their way of life was no longer sustainable. The National Trust for Scotland (NTS) said simple tools found on Hirta suggested Bronze Age travellers may have visited St Kilda 4,000 to 5,000 years ago from the Western Isles before people settled at an unknown date. Boreray's sheer sea cliffs and sea stacs are home to thousands of seabirds and what land is available is grazed by hardy feral sheep. The island's soil is fertile because of the actions of burrowing seabirds. Mullach an Eilein, the highest point on the isle rises to just above 1,260ft (384m), making Boreray the smallest Scottish island to have a summit higher than 1,000ft (304m). The discoveries by the Royal Commission on the Ancient and Historical Monuments of Scotland (RCAHMS) and NTS has suggested that Boreray, as well as Hirta, had settlers. The survey team said the stone building found was among three ancient settlement mounds. It could contain Iron Age artefacts. He said: "Until now, we thought Boreray was just visited for seasonal hunting and gathering by the people of Hirta. "But this new discovery shows that a farming community actually lived on the island, perhaps as long ago as the prehistoric period. "These agricultural remains and settlement mounds give us a tantalising glimpse into the lives of those who lived for a time on Boreray. "Farming what is probably one of the most remote - and inhospitable - islands in the North Atlantic would have been a hard and gruelling existence." St Kilda expert Jill Harden, who is contracted to NTS, said it was refreshing to know that there was still so much to learn about the islands. 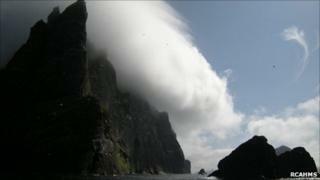 The finds were made during a five-year project to produce the most complete mapping record of St Kilda's built heritage. The survey, which began in 2007 and is to be completed later this year, uses satellite and digital technology to map traces of human occupation on the islands from early prehistory through to its modern military radar installations.